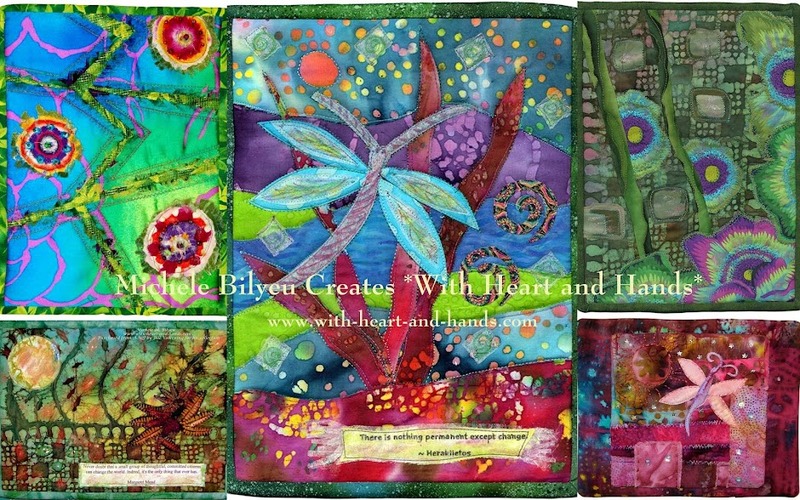 Michele Bilyeu Creates *With Heart and Hands*: When is an Art Quilt No Longer a Quilt? When is an Art Quilt No Longer a Quilt? As a quilter who also loves art quilting, I shy away from contests and challenges where my art will be unkindly commented upon, or judged. I always feel that my real life takes me away from the time I would truly want to spend on a big project that is meant to represent my skills or talents...so I don't do it at all. I also know that my chronic and severe lack of sleep has taken away from my ability to sew 'logically' and there are times I wonder why I sew at all with so many people to help ..in real life and online. So I also use that as an excuse. That makes me very sad to know that about my self. I recently had opportunities to create quilts for a number of quilt shows, found out about them within a few weeks of their deadline, and couldn't find my fabric that I'd knew would just be perfect ...if only I wasn't "so darn tired and could remember where I had put it!!!" I spent two days looking for my decades old specialty fabrics and still have never found my 'circus' fabrics ....I'm talking 4 inch polka dots, people... and then only had three days left to create. I gave up. I was just too tired and didn't care if it I did make something that it would travel to awesome places and be seen by thousands and thousands. I was too tired, and too unsure of myself with this theme and no obviously appropriate fabric at hand, and so little time to care to try. Turns out they let quilters in who at first appeared to break the size requirements and all of their online and printed off list rules. I should have just made something! I was sorry that I had made excuses and given up. Ever been in that place and time...oh, the regrets! Then, I was instantly ashamed of myself. 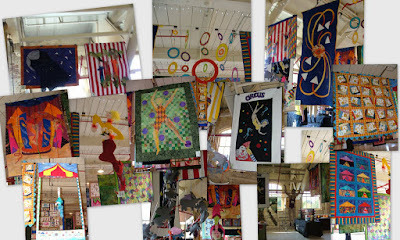 The stuffed elephants hung from a ring and under a circus tent...that was quilted. If you counted the entire length the mobile hung in space..from the quilted tent it met the size requirements. It was unusual, it had a quilt in it and it met the other rules. So, I had to ask myself...what makes a quilt? What makes it an art quilt? And why in the world was I judging and doing it out loud where even it's creator might have heard me?? What I was....was jealous. 'If that was all it took to get a project into a show'..my judging brain was saying...why hadn't I tried? That person, that quilter had created something, something unusual, something with a quilted section, something that in art might be called a quilted art installation piece. Loosely interpreted, for sure..for a lot of us, but they had made fabric art and entered fabric art..and it had been accepted into the show. I had not... and I had nothing. So, this piece taught me more about myself than perhaps about quilting. But it had its own impact...as all art should. I had wasted two days searching for that 'perfect' fabric in a horrendously packrat garage and the next two days deep in a rut... and artistically paralyzed. I had created my own artist's block and now I was comparing what I was seeing with judgment. But when does art quilt cross the line and become an 'installation' as some of those more unusual artists call their works.....you know the kind...silk banners all over Japanese hillsides...that kind of art. And when is an art quilt no longer a quilt? Well, it was interesting to think about... and good to know how, and why, I might judge. Judgment, as they say, is one finger pointing at someone else... and the rest of them pointing back at me. Ouch! Sometimes art can bring out beauty and sometimes it brings out pain. I think I might just be bruised from this one ;) Will I enter the next quilt show challenge I am offered..I don't know. Will you? That you continue to inspire other quilters is one of the things I love about you. Quilters are an inspiring bunch! Hi Michelle! Thank you for saying out loud what you think...be sure you are not the only one who had those thoughts. I mean it is human to be more or less judgamental, isn't it?. And i love the spontaneous moments too. It isn't important really. I think the same about what is art or what it isn't...what it is appreciated because is popular or trendy or things like that. Not important at all. To me love is more important than art and you inspire us with your life. 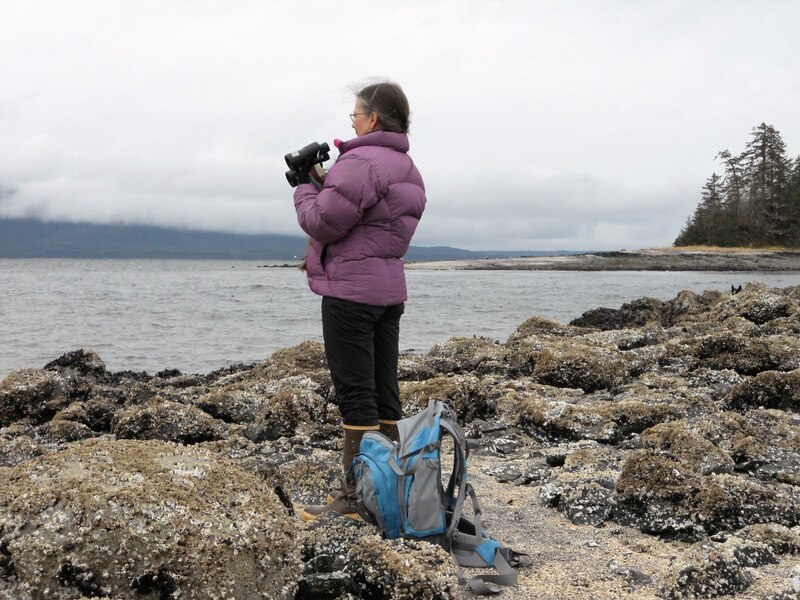 What i see in your blog and quilts is that you are an artist too but your heart has its priorities: to take care of your family. There you spend your full energy. Other artists choose art because they may not feel so much concerned on taking care of their family or they got help. I choosed family first too. Anyway i love this post. Great post! I often look at an object and think "I can make that" and somehow the fact that I am capable of making it devalues it in my mind. I picked it up from my mother. The fact is, I didn't make it, and changes are, I won't make it. And quite probably, if I did make it, I would want to sell it for a higher price. Michele, thank you for writing such a thoughtful and heartfelt message to those of us who faithfully follow your writings. We read your blog, because of who you are and how you express yourself. I've learned that if I feel a certain way about something, then there surely are other women "out there somewhere" who feel the same.You aren't alone in thinking about these topics, and your opinions are valued by many. You mentioned feeling some jealousy when you saw the entries in the show. Just a few days ago I admitted my feelings of what I called "quilter's envy" to a quilting friend. Similar to what you wrote about...and other things involved in my feelings too. I was embarrassed, but I know that this envy is a small part of who I am and that I can continue to change in good, important ways. There are so many other things I could say about your post--what a discussion that would be between you and many of your online friends! Please don't be hard on yourself. I simply know that you do more than your share of good things, of helping your family and those you don't know. I know that your comments have helped me over the past two years. Instead of rambling on, I'll say goodnight and thanks for showing us that we are all more similar than different. That's one thing that I've learned from my liberated quiltmaking and my blog reading and my participation in our liberated group. Oh Michele, what an amazing self-revealing post. My heart aches for you and at the same time I am proud to know you! Thank you for such a though provoking post. I have been to the "place" you are talking about. It takes lot of courage to speak up and out loud.. I think you did that here for a lot of us. You have inspired me to look within and find the truth today. Thank you! I always love your honesty and how you make me think and see how I do similar things to. Guess you are actually helping us today to see ourselves. Am I right? Anyway, you did me. Wow! I certainly can relate with excuses not to enter into shows and what might have been. Thanks so much for sharing your true thoughts, and know many others feel the same. 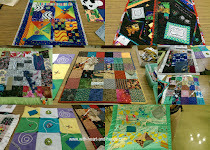 Right now I have a few quilts in a guild show and wonder what will others think of them. I spent over a week quilting one and yet I think how I could have done better. Well, thank you for sharing. Maybe we can let ourselves be liberated more.